RAYMONDVILLE — U.S. Immigration and Customs Enforcement is coming back to town. Yesterday, Willacy County commissioners reviewed a contract with ICE to hold inmates at a new 1,000-bed detention center here. County Judge Aurelio Guerra said commissioners reviewed the contact to determine whether it might include changes made after they approved the pact in a June 25 meeting. The detention center will open at the site of the former 3,000-bed Willacy County Correctional Center which shut down in March 2015, laying off 400 employees and slashing a third of the county’s $8.1 million general fund budget. From the audience, members of Austin-based Grass Roots Leadership and the Rio Grande Valley Equal Voice Network said they opposed the contract because it would lead to the detention of undocumented immigrants. 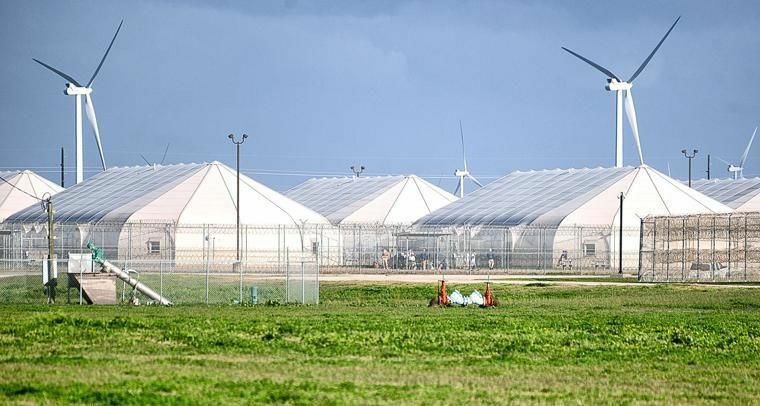 In May, Management & Training Corp. announced it was planning to open a 1,000-bed detention center at the site of the former minimum-security prison largely made up of tent-like domes. At the time, Raymondville Mayor Gilbert Gonzales said MTC was planning to hire 50 to 75 employees. As part of the sale, the agreement will pay the county $3 a day for every inmate held in the new detention center. At full capacity, the 1,000-bed detention center would pay the county about $1 million a year, calculations show. The contract will mark the second time ICE has held inmates here. In 2006, the $60 million 3,000-bed tent-city opened as an MTC-run detention center which held ICE inmates. However, under ICE the detention center fell far short of developers’ plans, with the agency filling about half of tent-city’s 3,000 beds. The prison’s closure led to the layoffs of 400 employees paid some of the highest wages in the area, sparking a financial crisis in this farming region. Ever since then, county officials have worked with MTC to land a contract to fill the prison site and create jobs in this area struggling with high unemployment.